We’re back on #TahitiTuesday / #TravelTuesday with a slight twist on “Our Favorite Resorts in Tahiti” series! While we have our own personal preferences, we realize that those properties aren’t always best for our clients. We get a lot of requests for Moorea and Bora Bora, so we decided to pay homage to the resorts we book most frequently or those that are most frequently requested (sometimes what a client requests is not what is right for them. So, we customize every package to suit the wants and needs of each travel request!) 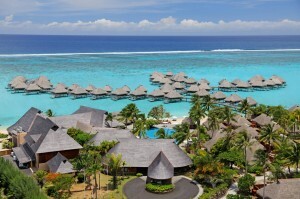 For our very first “Client Favorite” resort, we’re featuring the Hilton Moorea Lagoon Resort! 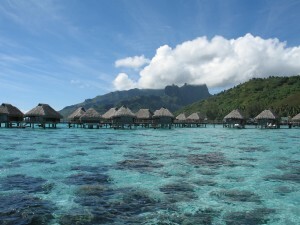 When we get a request for Moorea, often time the clients are not specific as to where they want to stay. They are open to suggestion, and if they are looking for a mid-to-large size resort, a resort that offers plunge pool options, has both a sunrise and sunset view, or one that has the amazing snorkeling, we recommend The Hilton. Many of our clients prefer to save money on Moorea by staying in a garden bungalow, so the Hilton is the best value option on the island. The Hilton has just over 100 bungalows, most of which are over the water. However, one of the most popular accommodations at the resort are the garden bungalows. The resort has a mix of garden bungalows, garden pool bungalows, deluxe garden bungalows, and deluxe garden pool bungalows. The difference between the standard bungalow and “deluxe” is that the standard is semi-attached, while the deluxe bungalows are stand alone. The deluxe bungalows are also situated closer to the lagoon and the beach. The standard garden bungalows are great for families and couples traveling together, but do not want to share a room. The standard bungalows are also great for those who have budget concerns. There are also two garden pool suites, which offer extended accommodations for families that do not wish to have separate rooms. As we mentioned, there are quite a few overwater bungalows. While most people save in Moorea to splurge in Bora Bora, if you can splurge on an overwater bungalow in Moorea, the Hilton is the place to do it. There are two categories of overwaters- standard and panoramic. Both categories are the same size and offer the same amenities, but the panoramic overwater bungalows are further out on the pontoon, allowing for better views. The best of the best view, however, is the one under the water. There is an extensive coral garden surrounding the resort which offers some of the best resort snorkeling in all of the islands. 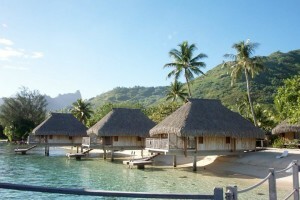 If you cannot afford the overwater bungalow price tag, also consider one of the Hilton’s three lagoon bungalows. These sit along the edge of the lagoon, half overwater, half on land. While the beach is more expansive in front of the main resort buildings and the water is quite shallow, the bungalows do offer a beachfront location and private, direct access to the lagoon. Another highlight of the overwater bungalows is the crepe bar, located in the middle of the pontoon. In the evenings, they serve sweet and savory crepes as well as a variety of alcoholic and non-alcoholic beverages. You can enjoy crepes while looking out toward the expansive lagoon. The Hilton also has a fairly long stretch of beach, a spa, an infinity pool looking out toward the beach, and two restaurants. While the resort offers complimentary kayaks, canoes, and paddleboards, you can also arrange a variety of excursions with the concierge or stop by the dive shop to set up a few dives around the island. Moorea is reached via interisland flight on Air Moorea from Tahiti or on Air Tahiti from a variety of other islands. 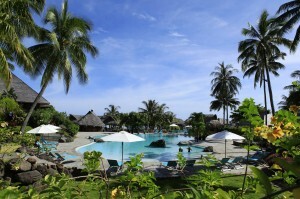 It is also accessible via high speed ferry from the Papeete port. The ferry transfer is 30 minutes. Upon arrival, land transfers to the Hilton can be arranged by your travel agent from the airport. We highly recommend a stay at the Hilton if you are looking for a larger, more modern resort or if you are an avid snorkeler. A stay at the Hilton pairs well with a stay on Bora Bora at almost any resort, though the Hilton does have a sister property (Bora Bora Nui) which complements the Hilton Moorea very well. Moorea is also a great island to visit on its own. There is much to explore on Moorea and the Hilton offers comfy accommodations and many amenities to make a longer stay a very attractive option. We recommend around 4-5 nights when combining with Bora Bora or another island or stays 0f 5-7 nights when only visiting Moorea. For additional information on the resort, please feel free to check out our trip review from our most recent stay at the Hilton. Please contact me with any additional questions or to book your Moorea Escape!! !